Viewing topic "Epic piano sound on Motif SX 8"
I love piano sound, so I bought Epic piano samples and loaded on my Motif SX 8. the sound is not real like piano sound, it sounds like a guitar. Do I need to have a special PA system to make it sound like a piano sound. I watched a demo for Epic piano samples, it’s sound are so good, but mine not. It’s hard to say whether what you’re hearing is due to characteristics of your sound system, or that the particular piano sound doesn’t happen to meet your expectations. Piano sound tends to be a personal preference. Are you listening in stereo, with both L and R outputs fed to separate amplification channels (or on headphones)? Reproduction in mono can tend to make the sound very unsatisfying. I presume you’re referring to the Epic Grand library from K-Sounds. If so, another variable is whether you loaded the 126MB or the 505MB version. You might want to contact http://ksounds.com/contact/ and explain your concerns. I loaded both of version and listening it on headphones that plugged in a Yamaha mixer and also on a pair of Yamaha power speakers. 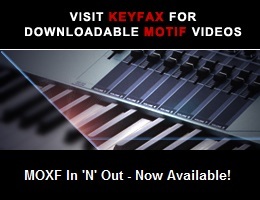 I listened a demo on youtube, they used Epic piano samples on Motif SX 8, the sound is really good, but mine is not. I think they might have a good sound system, but I don’t know what it is. Yes, I tried all piano sounds from the samples, it sounds like guitar. When using the speakers, are they connected directly to the XS’s L and R main outputs, or is the mixer between the XS and speakers? If you’re using the mixer that way, try removing it, connecting the speakers directly to the XS with TS cables, and see if that makes a difference. I connected the SX to the speakers directly it sounds better, but it’s not good as the one that I heard from a demo on the youtube. I uses HS5 that has 5” cone, so do you think I should have a bigger cone to make it sound better? What speakers are you listening to the demo on? Are they in the same room as the XS8 and HS5 speakers? The Yamaha HS5 speakers have decent frequency response for their size, but of course roll off a piano’s lowest octave. If that is what you think is missing, then getting a subwoofer such as the Yamaha HS8S might help. In my experience, often complaints about the way piano sounds on a synth are related to the velocity at which the keys are being played. At too-low velocities, piano will typically sound unimpressive. Sometimes speaker volume is set too high, so that the player tends to strike the keys softly in order to keep the sound level down. In that case it’s better to reduce the MASTER VOLUME slider position and play with more force. Also, what is the XS’s Velocity Curve set to? and try setting Velocity Curve to “soft”. I just listened the demo on my computers then I can hear their sound very good. Wow..the velocity is really impact to the sound. with velocity curve set to soft, I can hear piano sound much much better. Although it is not good as the demo, at least I can now hear piano sound on my motif SX 8. May be my sound system is not good. All right, I really appreciate your helps and thank you very much, 5pinDIN. Wow..the velocity is really impact to the sound. with velocity curve set to soft, I can hear piano sound much much better. Although it is not good as the demo, at least I can now hear piano sound on my motif SX 8. May be my sound system is not good. All right, I really appreciate your helps and thank you very much, 5pinDIN. You’re welcome. I hope you find a setup that meets your expectations. I will check it out, again thanks a lot 5pinDIN. Yeah, I’ll concur!, but not with guitar statement??? they do sound great on Youtube & ?? ?,,, i have an incredible sound system, i own all the aftermarket pianos, their usable but, i always go back to to the original full concert grand on my XS8 or the S700 loaded from loyality disk when i REALLY need to use piano, i did edit out the soft first layer on the S700, those two piano’s are all i use any more,,,could have save a lot of money, lesson learned! I agree the You Tube video sounds great to me. I personally use the Kawai 2 piano sound on my Motif ES and I think it sounds great through anything that I have put it through, being my Barbetta Amp, or whatever is available as a backline amp. This includes Peaveys, TOA Amps, Roland Amps, etc. I’m not sure as to why the Epic Grand would sound like a guitar. Kevin is quite the programmer when it comes to piano and organ sounds. I only wish he would take the time to program some real fat Brass sounds for Earth, Wind, and Fire, Tower Of Power, or other groups of that era. I would be the first to buy it. I know it will be spectacular. I know that there is Artikulation, but strictly sounds as described above is for me.